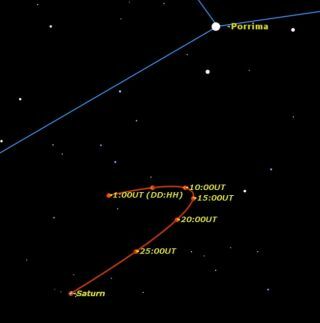 For the next month, the planet Saturn will have a close encounter with the double star Porrima, making for a nice show in the night sky. Porrima, also known as Gamma Virginis, is one of the best-known binary stars in the sky. Its two bright component stars orbit around each other once every 169 years. The two stars are almost equal in brightness and are located just 39 light-years away from the sun. Their orbit appears elliptical from our point of view, and in recent years the two stars have appeared extremely close together, so that in early 2005 they were separated by only 0.35 arc seconds. At that time, it required a telescope with at least an aperture of 13 inches (330 mm) and absolutely perfect viewing conditions to separate these two stars. This year, only six years later, the gap between the two stars has widened to 1.75 arc seconds, resolvable by a 3-inch telescope (75 mm). Many experienced astronomers have stopped looking at Porrima because it’s been too close to split in recent years. Beginning this year, its component stars are now far enough apart to be visible as a very close pair in all but the smallest telescopes. In the sky map available here, Saturn's path is plotted over the month of June, with red dots marking Saturn’s position at 00h UT (8 p.m. EDT on the previous date) on June 1, 5, 10, 15, 20, 25, and 30. Saturn’s path looks like a fish hook because of Earth’s motion around the sun, which is what astronomers call a retrograde loop. The next week or two is an excellent opportunity to actually see a planet appear to reverse its direction, something that long puzzled ancient astronomers until Nicolaus Copernicus provided an explanation in the 16th century by moving the center of the solar system from Earth to the sun. Saturn begins the month 18 arc minutes southeast of Porrima, slightly more than half the moon’s apparent diameter. By June 9, it is at its closest to Porrima, just a hair over 15 arc minutes away, almost exactly a half-moon diameter away. By June 30, the distance has grown to 30 arc minutes, a full moon diameter away. However, at any point this month, both Saturn and Porrima will share the same field of view in a low-power telescope eyepiece (less than 100x): a very pretty sight.